Question: Why did Blaine Soccer Club apply for Players First licensing? Tori Burnett, 13-U & 17-U Girls Coordinator of Blaine Soccer Club: Blaine Soccer Club has gone through a major transformation in the past three years. Applying for the Players First license was our first opportunity to assess our progress alongside the best clubs in the nation, and showcase the effort put into our club’s new direction. We have invested considerably into our club, coaches, and culture in order to create a more comprehensive experience for our players. 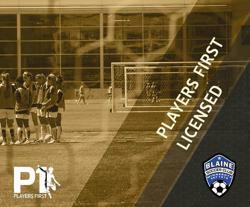 Question: What does it mean for Blaine Soccer Club to now be an official Players First-licensed club? Burnett: We feel that we have created something new and exciting at Blaine Soccer Club, and this licensure is a seal of approval that we are heading in the right direction, as well as an affirmation that we are being true to the values of the club. Being nationally recognized as a Players First-licensed club is a testament to all of the hard work from our coaches and administration that goes on behind the scenes, and the buying in and support of our players and families to our new direction. It is an honor to know that our efforts are being nationally recognized alongside some of the best clubs in the nation. Burnett: Even if our club won every single game this year, all of those combined victories would not mean as much as the Players First licensure because we believe youth soccer is about so much more. At Blaine Soccer Club, youth soccer is about the journey and growth of the club, coaches, and players on and off the field. Knowing that the beliefs of US Club Soccer align with the values of Blaine Soccer Club empowers us to continue to provide an unbeatable Minnesota soccer experience, providing a space where everyone can grow their love for the game. Question: What would you like the parents of Blaine Soccer Club to know about what this means to them? Burnett: The Player’s First Licensure separates Blaine Soccer Club from other clubs in the Twin Cities and allows us to continue to build upon the foundation of our club values. We want more than just success on the field; we want our members – players, parents, coaches, and everyone involved – to excel. Above all else, we want to foster an environment where great players can also be great people, making us a great club.